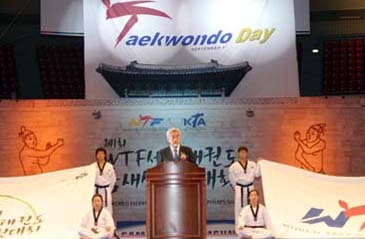 World Taekwondo Federation's 1st "Taekwondo Day"
The World Taekwondo Federation celebrated the 1st "Taekwondo Day" on Sept. 4, 2006, in a ceremony. During the opening ceremony of the 1st WTF World Taekwondo Poomsae Championships at the Olympic Gymnasium in Olympic Park in Seoul, an event to mark the inauguration of Taekwondo Day was held. The event drew ranking taekwondo officials, including Mr. Jung-kil Kim, president of the Korea Taekwondo Association, Mr. Woon-kyu Uhm, president of the Kukkiwon and Mr. Dai-soon Lee, president of the Taekwondo Promotion Foundation. Also on hand was Ms. Bae-sook Cho, chairwoman of the National Assembly Culture & Tourism Committee. During the event, WTF President Chungwon Choue declared the inauguration of Taekwondo Day and the symbol of Taekwondo Day was unveiled for the public. The WTF designated Sept. 4 as Taekwondo Day during its General Assembly in Ho Chi Minh City, Vietnam on July 25, 2006. The rationale for designating the date of Sept. 4 as Taekwondo Day is that on Sept. 4, 1994, the 103rd IOC Session held in France decided to accept the sport of taekwondo into the official program of the Summer Olympic Games. Taekwondo was an Olympic sport at the 2000 Sydney and 2004 Athens Olympic Games. It will be also a medal sport at the 2008 Beijing and 2012 London Olympic Games. During the Taekwondo Day event, the congratulatory message from Jacques Rogge, president of the International Olympic Committee, was read. "The World Taekwondo Federation has taken the decision to commemorate the inclusion of taekwondo on the Olympic programme at the 103rd IOC Session on Sept. 4, 1994 in Paris," Dr. Rogge said in his message. The IOC president continued to say, "The IOC is pleased that this event also linked to a major competition which will highlight this sport in your country and attract the attention of the general public, particularly the younger generation, which can be sensitised to values such as respect and fair play." WTF President Choue said in his opening speech, "The fact that we have a Taekwondo Day is testament to the endeavors and sacrifices of our masters, athletes, referees and officials." "The 1st Taekwondo Day is not just a showpiece of our enhanced international standing; it is also a day when we recognize each other's efforts. For this, and more, I wish to thank every one for your dedication and continued support for taekwondo and the WTF." "We have the potential to contribute positively to the world. Let us fulfill that dream from today, starting with the 1st WTF World Taekwondo Poomsae Championships," Dr. Choue said. He continued to say, "Poomsae is a unique discipline of taekwondo that has no equals. It is not kyorugi, but it encompasses all of its features of strength, speed and accuracy." "Through poomsae, we hope to show that taekwondo is also about technique and grace." Dr. Choue said, "Poomsae "has the potential to be a valuable tool to social harmony. From young children to the elderly, poomsae will help create a strong bond of unity and strength." "I also believe that poomsae will be beneficial to athletes with disabilities; for them to gain self-confidence and fulfill their Olympic dreams," he said. "For these reasons, I hope that someday, poomsae will be accepted by the International Paralympic Committee." In this vein, a special taekwondo demonstration by the disabled was performed during the opening ceremony of the three-day WTF World Taekwondo Poomsae Championships, which drew about 600 athletes and officials from 59 countries. At its General Assembly in Ho Chi Minh City in late July, the WTF approved the establishment of the Paralympic Committee, with the aim of studying ways to include taekwondo in the official program of the Paralympic Olympic Games. To mark the 1st Taekwondo Day, the WTF issued commemorative postage stamps. An enlarged WTF Taekwondo Day postage stamp was also on display for the public along with other commemorative taekwondo stamps collected at home and abroad at the second floor of the Olympic Gymnasium. "The designation of Taekwondo Day and the launch of the World Taekwondo Poomsae Championships would combine to help expand the base of taekwondo population around the world," said WTF President Choue. In the afternoon, WTF President Choue is scheduled to host a reception at the Olympic Parktel nearby the Olympic Park to mark the 1st Taekwondo Day and to welcome the participating athletes and officials in the WTF Taekwondo Poomsae Championships.